Anyway, it's a new week, so that can only mean one thing - it's time to obsessively pore over film from the weekend to bring you our Five Plays that Paid Off! Our first Play that Paid Off of the week comes nominated by Oliver Inwards (@oinwards) - that's his second nomination in two weeks, nicely done Oliver! If you want to become as much of a TPL celebrity as Oliver has now become, you too can nominate a play to be broken down - and you can still nominate a Week 3 play from MNF tonight, so keep your eyes peeled for big plays! All you need to do is tweet a description of the play with the hashtag #TPL5plays and if we break down that play, you'll get suitably rewarded, just like Oliver. And who doesn't want to be like Oliver? Terrorists. Terrorists don't. So, don't be a terrorist, nominate a Play that Paid Off! This play features no trickery, no gadgetry, no bells or whistles, but is rather just an incredibly successful, almost perfectly executed play (we're looking at you, Eachus), but it offers us a fantastic opportunity to explore how outside zone blocking schemes work, as it features examples of pretty much every aspect and every scenario of the outside zone. NB: What, you were expecting the diagrams to be to scale? They're rough guides only, I'm afraid. 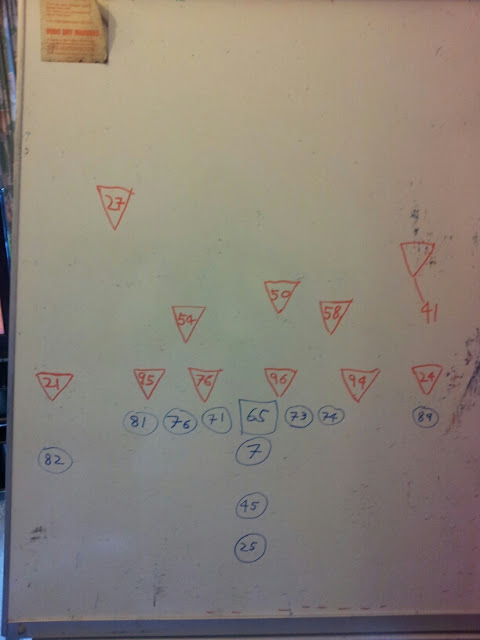 After the huddle/pre-snap: The Chiefs line up in I-left (I-form in the backfield, tight end to the left), the Saints line up in their base 4-3 with the safeties in a Cover-2 shell. No motions, no audibles, save for Lilja appearing to identify Lofton as the 'Mike' there is nothing really to mention about any pre-snap action, just the teams lining up as they do in Fig 1. The play: The play is actually pretty straightforward, but it gives us our first example doing the Five Plays that Paid Off series of the outside zone. Offensive line blocking schemes, at their most basic, will be based on one of two sets of principles - man blocking, and zone blocking. The two are pretty much what they sound like - in man blocking, each blocker is responsible for a man; in zone, each blocker is responsible for a zone (in practical terms, one of the two gaps either side of them, though it also refers to blockers 'zoning' together on a defensive lineman - but more on that later). Zone blocking has been around for decades at all levels of the game, but really rose to prominence in the NFL in the mid-80s under Howard Mudd, offensive line coach for the Cleveland Browns between 1983 and 1988. While the principles of zone blocking are always the same, zone blocking schemes are often further divided into two separate techniques O-lines use to implement those principles - namely, inside zone and outside zone. 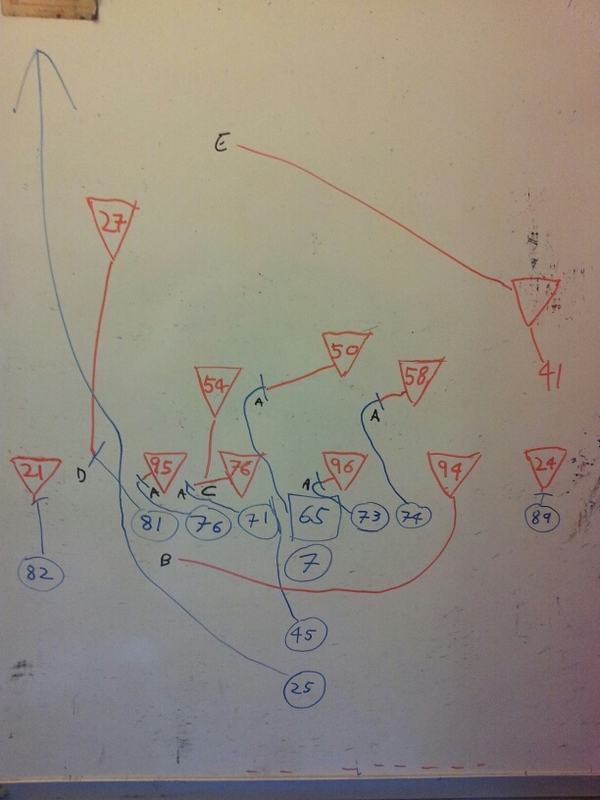 We'll deal with inside zone when we break down a play in which it features, but we'll stick with outside zone here. In all basic zone blocking schemes, the offensive line move as a unit in the same direction, to the left or to the right - in this particular instance, the KC line is zone blocking to the left. 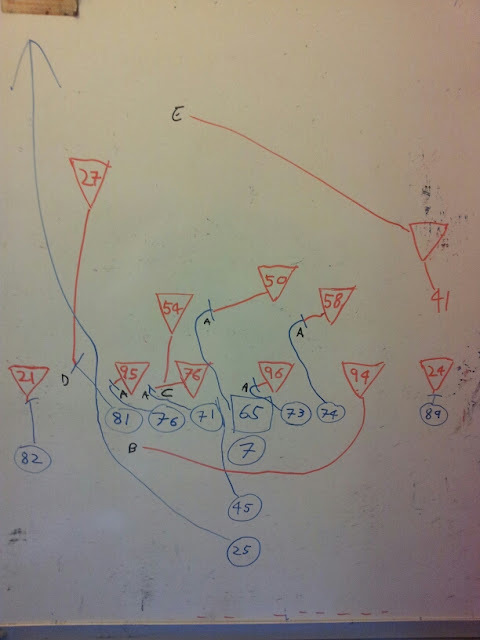 To execute an outside zone block, the job of the offensive line is to gain outside leverage of the defenders they are to block, and then block them back towards the inside, sealing them in for the running back to run around the outside - represented in Fig 2 by 'A'. Of course, you typically have more offensive linemen than defensive linemen - especially as, in most zone schemes, the backside-most defender on the line of scrimmage (i.e. the one furthest away from the direction the play is going) is often left unblocked. This leaves two offensive linemen without a defensive lineman to block, who are termed 'uncovered'. The uncovered offensive lineman looks to the next man along in the direction of the play. If the OL next to them is also uncovered, then he moves up to the second level (i.e. linebackers) - for example, in Fig 2, right tackle Eric Winston sees that right guard Jon Asamoah is also uncovered, so he moves up to the second level and gains outside leverage on Scott Shanle, sealing him away from the play. If an uncovered lineman looks to the next man along and sees that he is covered, however, then his job is either to double-team the defensive lineman covering his neighbour (if it is inside zone), or, in outside zone, to take over blocking the defensive lineman completely, freeing up the covered blocker to move up to the second level. Handily, this can also be seen in the actions of Asamoah and center Ryan Lilja. After the snap, Lilja runs past Tom Johnson to the second level, but uses his right hand to 'stab' Tom Johnson's playside shoulder as he passes, which causes him to turn slightly and allowing Asamoah to outside of the DT and seal him away from the play while Lilja moves up and blocks Curtis Lofton. In reality, it's rare that all five linemen will get a perfect block in outside zone - consider how far the left tackle and left guard have to reach to get outside leverage on their two defenders - so some of the blocks end up more as drive-blocks (i.e. driving the defenders straight backwards) than sealing them inside... and there's a bit of holding on the play too in order to seal up the defenders. But, what the shoddy replacement refs don't see, the offensive line get away with. Three of the defensive linemen and two of the linebackers get completely blocked out the play by one of the linemen - the other DL and LB are dealt with at points 'B' and 'C'. As mentioned above, in zone blocking schemes, typically the backside defender on the line of scrimmage (either a DE or an OLB depending on if the defense are playing 4-3 or 3-4) is left unblocked, and this play perfectly illustrates why: simply put, when you have as explosive a running back as Jamaal Charles, then as long as the OL do their job there is almost no chance that the backside defender has the speed to run down such a fast running back from behind. That leaves one defender in the front seven unaccounted for - WLB Will Herring. Schematically, he is almost certainly the responsibility of the fullback, but the FB appears to go up a hole too early to get to the linebacker, turning upfield inside, rather than outside, of LG Jeff Allen's block on Akiem Hicks. However, Herring also makes a wrong-hole snafu. Herring seems to believe that Charles is going to cut up the 'B' gap (between LT Albert and Allen), and comes down to meet him, marked by 'C' in Fig 2. Charles, however, gets to the outside of the line before cutting up field; as a result, Herring has slow down to get around Allen & Hicks, by which time Charles is past him. There is one more key block that is made to spring Charles free. As said above, the ideal for an outside zone blocker is to get outside leverage on their assignment and block inside; however, it is not always feasible for a blocker to be able to get to the outside of the defender in question. In this case, blockers are taught to block the defenders towards the playside sideline. On this play, that is exactly what tight end Tony Moeaki does in blocking free safety Malcolm Jenkins. Jenkins comes down to try and tackle Charles, but Moeaki has gotten out in front and blocks Jenkins towards the sideline, sealing him to the outside. Charles cuts up inside of him, then runs down the sideline. All that is left is to outpace strong safety Roman Harper, who has taken too shallow an angle on Charles (marked by 'E' on Fig 2), and Charles is away for a 91-yard touch down to inject a shot of life into the Chiefs, starting the comeback that would eventually net them their first win of the year and send the Saints to 0-3. Remember, there is no such thing as nominating too many plays for us to break down, so please do nominate any play that particularly impresses you during MNF tonight, either by tweeting a description of the play with the hashtag #TPL5plays, or by nominating a play in our Facebook group.